H. Rick Bamman - hbamman@shawmedia.com Richmond Brat Haus owners, brothers Tony (left) and Jerry Garbis with a cold one and a best seller of Bavarianwurst with sautéed onions and sauerkraut and fries. 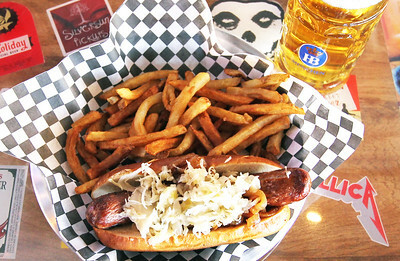 H. Rick Bamman - hbamman@shawmedia.com Richmond Brat Haus Bavarianwurst with sautéed onions and sauerkraut and fries. 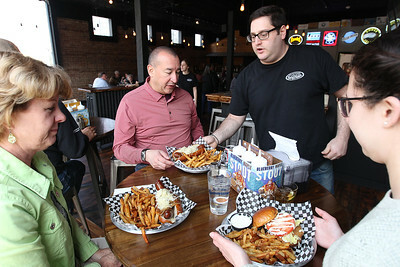 H. Rick Bamman - hbamman@shawmedia.com Richmond Brat Haus co-owner Tony Garbis serves Amy and Bob Rodriguez of Kansas City and their duaghter Kelsey Rodriguez of Chicago during the lunch rush on Wednesday, April 12, 2017. 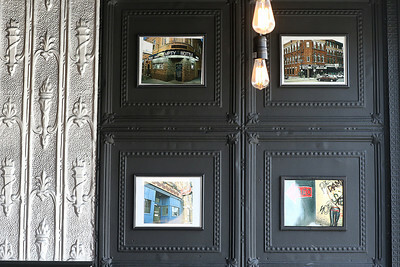 H. Rick Bamman - hbamman@shawmedia.com Richmond Brat Haus dacor includes photogrpahs of punk bars in the Wicker Park neighborhood of Chicago. 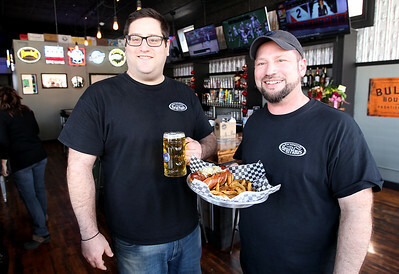 Richmond Brat Haus owners, brothers Tony (left) and Jerry Garbis with a cold one and a best seller of Bavarianwurst with sautéed onions and sauerkraut and fries.